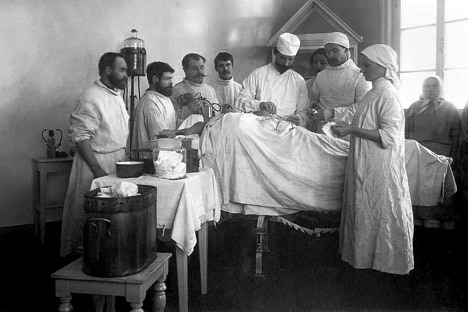 The Anglo-Russian Hospital, with 200 beds, opened in Petrograd on 12 February 1916. The opening ceremony was attended by the Russian Tsarina Alexandra, her elder daughters Tatiana and Olga and the British ambassador to Russia George Buchanan and his wife Georgina. "May my ministers be informed that Great Britain has decided to establish an Anglo-Russian hospital in Petrograd for the wounded of Her Majesty Queen Alexandra. My government, wishing to help this initiative and in doing so express Canada's admiration for the prowess and courage of the Russian forces, believes that the UK government will inform the Imperial Russian government of Canada's donation of 10,000 pounds sterling for the hospital." Recently, an exhibition of graduation projects and other school works has been set up in the building for "female courses of higher architectural knowledge" to be reviewed by a society of architects and artists. This is the first graduation in the school with its new teachers and directors. There are nine female graduates and the work of one graduate has been awarded a trip abroad. It is strange but until now women's efforts and talents have not been applied in the field of architecture and we must therefore wish success to the director's wonderful initiative. First and foremost it is necessary that the students' work is not academic. On November 19 an emergency meeting of the members of the society Economic Renaissance of Russia took place. The issue of establishing a private factory to produce munitions was discussed. It was unanimously decided to follow through with equipping the factory. A signed statement of shareholders was created. The total value of the shares was determined at 25 rubles. A preliminary collection of funds raised a substantial amount. The new play Airman has successfully premiered at the Nezlobin Theater. Perhaps it would have been more apropos to name it Man Without Air or Men of the Line. Two worlds are vividly juxtaposed in the play: the bourgeoisie and the petit bourgeoisie, which is almost destined to lead a proletarian existence. The wealthy are afraid of the "line." They live in clover – they have as much air as they want. There are those who suffer, those "deprived of air," but they are also deprived of any "meaning." This is the wisdom of the man who is "deprived of air." The play ends not with a "dissonance," but "happily." One protagonist gets married, another receives the opportunity to relax.